So here we are at the end of summer! Your swimwear has been tearfully packed away under the bed and that hopelessly optimistic BBQ grill is back in the shed after just three uses. Summer may not be back for a while, but do not despair. We have the most perfect set of world wall maps, to make your home seem warm, cosy and inviting this autumn! The Executive World Map is absolutely stunning and adds a touch of class to any room. Upon closer inspection, you’ll see that it elegantly displays town and city population detail as well as geographic information that you might expect from any historically accurate map. We’ve also paid a lot of attention to hill and ocean shading that really accentuates its style. This map suits anyone with a passion for art who loves to collect paintings, portraits and still art around their living room. 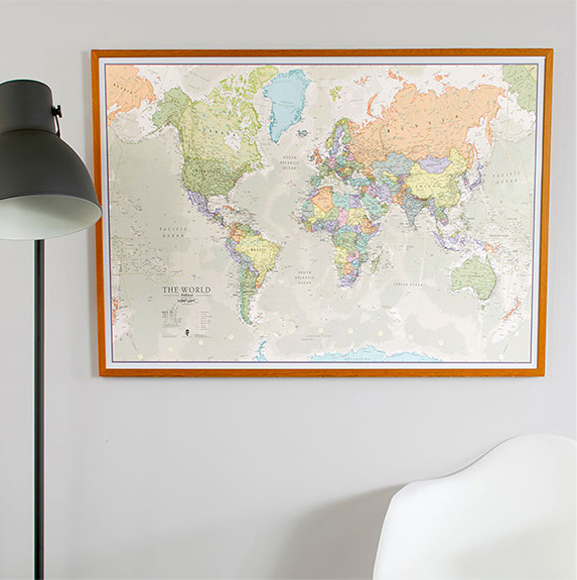 If you love rearranging furniture and frames every year, you’ll love the Executive World Map. 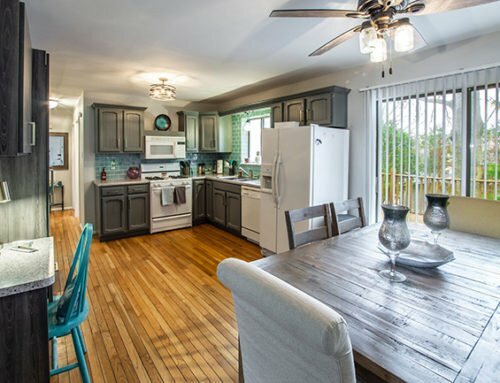 Autumn is the perfect time to putter around the house to make it feel more like home! The Executive World Map makes an excellent focal point in the middle of any living room so a canvas finish would be perfect. Prop it either over a fireplace or on your largest wall space. Pulling in either a comfortable couch or a set of armchairs under, it will really bring out its colour as a contrast. Lighting is important to consider, as well. If you’ve got a small room, you could go with a floor lamp on one side, or if it’s above a mantelpiece, you can even experiment with a lantern or candles! You’ll fall in love with the Classic World Map this autumn. You can personalise it by choosing a title and subtitle, and even add pins and tags for a truly personal map print. The vintage style of the map art is what really adds to the ‘X’ factor with this one. 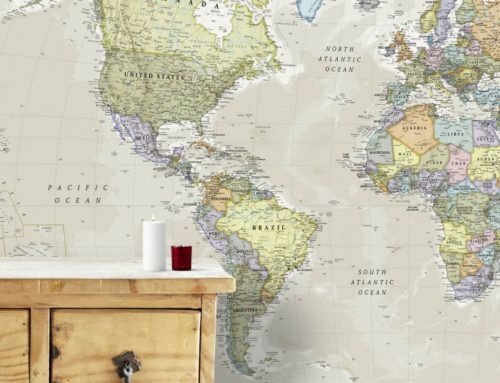 The Classic World Map comes complete with up-to-date political detail, and each country is shaded in different stunning tones, making it a marvel to behold from up close and when viewed on a wall at a distance! If you’re either a travel enthusiast, or a voracious note-taker, this map is perfect for you. You can really make it yours by adding photographs and small notes on it to reminisce about past travels or to plan new trips. There’s something really special about a map that evokes amazing memories, that tells a story about the people in the home it hangs in! There’s two ways you can play with this one. You could easily have it behind your bed as a DIY headboard for your bedroom. Or if you’ve gone for a medium size and want it for a living room, you can surround it with photo frames or travel books. You can even go for some small custom art below it. This would be ideal in a room with a light coloured wall, or one with plenty of natural light. 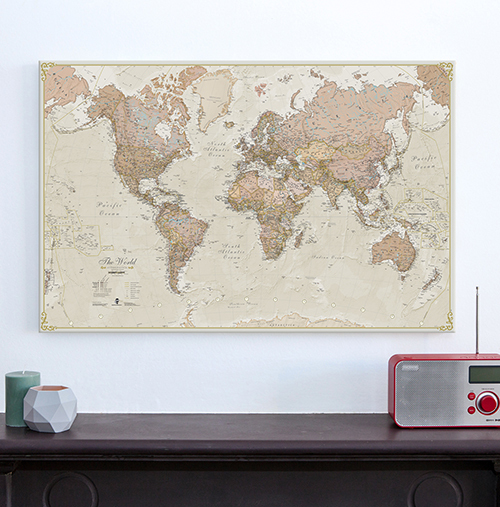 The Antique World Map is a rather elegant take on a world map, with a muted tone, and an artistic finish. It can be a real talking point as it looks exquisite on a wall, especially if you’re going for a vintage look. Like the Executive World Map, the Antique World map comes to life with amazing hill and sea shading and every country border is shown to be very clear and is up-to-date. If you’re the kind of person that’s constantly collecting trinkets at a Sunday market, or cannot get enough of the Antiques Roadshow, this map would find a very welcome spot on your wall. If you appreciate expert cartography, you’ll be able to spot the attention to detail that’s gone into creating this map. Mixing a living room with different styles, colours and patterns is certainly an advantage here and relatively inexpensive to achieve. For instance, the light from a lovely modern floor lamp to one side of this map will softly illuminate its surface giving it timeless appeal, especially if it’s framed. If you have traditional upholstery, that will go well here and you can complete the look with a nice soft and patterned rug. For one thing, the south is at the top of the map, and the north is at the bottom! Upon first glance, the Upside Down World Map takes some getting used to, especially when you consider what our current perception of our hemispheres is but it will guarantee to be a talking point amongst any guests to your home. If you relish the idea of breaking rules, and find joy in analysing and exploring different views, the Upside Down World Map will be perfect for you! 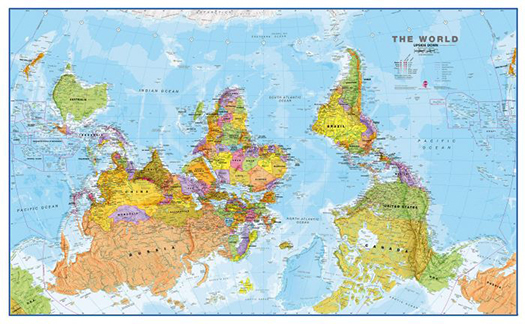 Just as the map helps you appreciate that our world is spherical rather than flat, you probably appreciate that there’s more than one way to look at any problem, let alone solve it. While this map could well be an educational tool aimed at secondary school children, it also makes a fantastic addition to a family room or a study. You can prop it up against a desk, and surround it with similar trinkets that make you think as well and get your creative juices flowing, such as a Rubik’s Cube, board games, or even something functional like a tearaway calendar or to-do list. If you’re displaying it for others, it will look lovely with modern minimalist furniture design, on a white or cream coloured wall with plenty of light. Sometimes the simplest choice is the best one to make. The Political World Map is one of our finest selling maps and can be a wonderful educational resource and great for geography enthusiasts alike. Every single country on the Political World Map is a different colour, and all boundaries have been carefully noted and marked by our expert team of cartographers. All major towns and cities are featured on this map and capital cities are clearly marked and easy enough to spot. If you’ve just got back from holiday or are already planning your next jaunt, or even if you’re generally interested in geography and world affairs, you’ll really love the Political World Map. 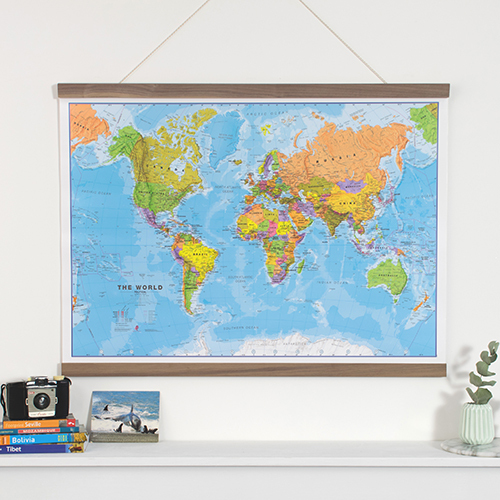 Whether it’s a living room, study, office or a larger space, the Political World Map will make a stylish feature to pay homage to your favourite travels. Choose the hanging bar finish, and you can really rack up some style points, when you hang it above a study desk. 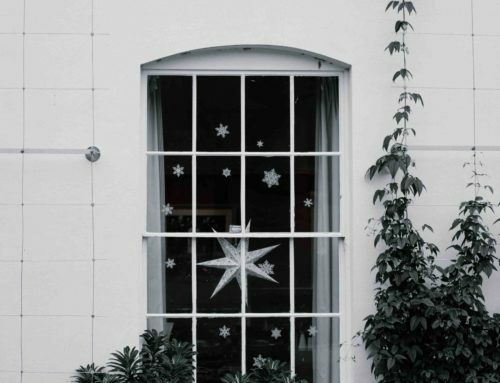 Or if you’ve got really large windows and a brightly lit room, hang it directly opposite, and it will make an elegant addition to your wall.